When one of the UK’s leading aluminium die casting specialists needed a new solution to ensure the parts it makes for car giant Jaguar Land Rover met the highest possible standards of cleanliness, the company looked no further than Tewkesbury based aqueous parts cleaning specialists MecWash. JVM Castings manufactures parts for the automotive sector from its factories in Worcester and also Tamworth, Staffordshire, and already benefits from having installed several MecWash machines which ensure the firm’s cleaning processes are as robust as possible as well as being able to cope with an output which can be up to 15 tonnes per hour. 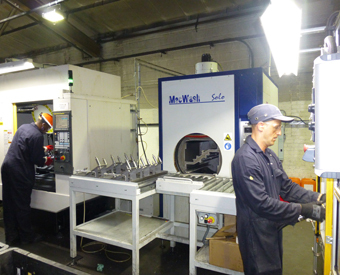 Nigel Phillips, senior engineer at JVM Castings, explains: “We find MecWash systems both easy to install and operate as well as delivering excellent results so when we needed to find a new cleaning solution, it was obvious that we should contact the company again and see what they could recommend. “The problem was that our existing systems did not have sufficient capacity to cope with cleaning and drying the link shaft brackets currently being manufactured for Jaguar Land Rover. “When dealing with such a prestigious name in the automotive industry, it is important for us to ensure that all of the parts we supply them meet the highest possible standards of cleanliness. As we currently use MecWash systems, we know their technology is well proven so we were happy to follow their recommendation and invest in a Solo 400 with 800mm drum,” he added. MecWash’s Solo is a popular choice that has already been supplied to more than 200 customers around the world, all of whom have been impressed with its ease of use and versatility. Rotational washing, mist rinsing and hot air drying ensure the Solo effectively removes preservative oils, machining lubricants, metal swarf and chips from machined components and this is all done in a very compact footprint, making it ideal for a factory setting where space is at a premium. The whole process is also fully enclosed so the system doesn’t produce any steam or unpleasant vapours. MecWash Managing Director, John Pattison, said: “Many of our customers have more than one of our systems installed to either deliver different cleaning demands or else to help boost their productivity by enabling them to clean more parts at the same time. “I am delighted that JVM Castings came to us again when they needed a new system and that we have been able to deliver such impressive results for them. “All of our machines are custom-built for individual requirements and, for JVM Castings, it was really important that the Jaguar Land Rover parts could be easily loaded as well as cleaned efficiently. We were able to supply a specially designed fixture that could be placed inside the Solo’s wash chamber. “Once the parts are placed in this fixture, then the chamber is indexed through 180° and a second fixture can be loaded, allowing for greater economy of use as twice as many parts can be cleaned in a single washing cycle. “Once loaded, the operator simply selects a programme through the operator display and presses the start button. The Solo’s door will then automatically close and the washing and drying cycle follows. A few minutes later the operator unloads clean, dry parts.” he added. Nigel Phillips, senior engineer at JVM Castings, adds: “The Solo addresses all of the issues we were having and we’re now experiencing excellent cleaning results from the machine. “MecWash has again come up with a solution to help us strengthen our long-established relationship with Jaguar Land Rover. This dates back to 1963 when we supplied pulley castings for the Rover P4 and today sees us make complex structural parts such as the award-winning F Type B Pillar for them as well as continually developing new products to meet the automotive industry’s changing needs,” he added. With a customer list that includes the likes of Rolls-Royce, JCB, Perkins, Delphi, TRW, UTC, Meggitt, Selex, Renishaw, SKF, Hydraforce and Parker, the outlook for MecWash is looking bright for 2016. For more information about MecWash Systems Limited please visit www.mecwash.co.uk or call 01684 271600 to discuss your parts cleaning requirements.